Who else is ready for some quality porch sitting time this summer? 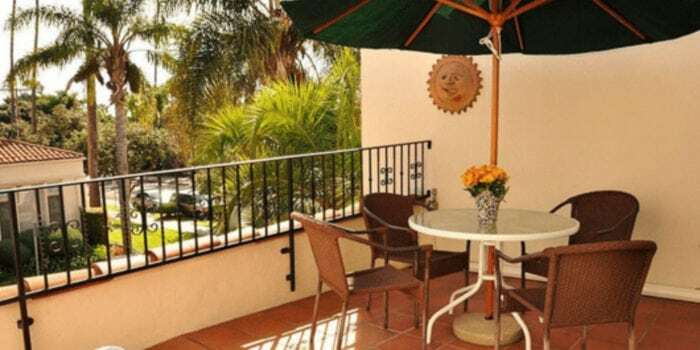 If your hand flew up into the air as you shouted, “Yes, please, let it be me,” then it is time to introduce yourself to The Eagle Inn, because we proudly offer the best hotel room with a porch in Santa Barbara. Just imagine kicking back on your porch to watch a beautiful sunset after a day at the beach or a stroll along Stearns Wharf. Use one of our complimentary bikes to take in the sights or go shopping on State Street, come back to our restful beachside hotel, grab some of our freshly-baked cookies in the afternoon, and head up to your room for a romantic couples massage. Follow that with some porch time that includes champagne and chocolate-dipped strawberries. What a beautiful end to a fabulous day! Or you don’t have to do anything at all except sit on your porch and take in the views. Our family-owned Santa Barbara bed and breakfast is an excellent example of Spanish-Colonial architecture. You’ll feel like you’ve taken a step back in time because this is a style characteristic of historic Santa Barbara. As you laze under the golden southern California sun in our intimate and peaceful setting, be sure to smell the flowers, feel the soothing Pacific breezes, and listen for the sounds of the ocean – just three minutes away. Our Santa Barbara lodgings have often been described by our guests as “beautifully quaint” and “a hidden treasure.” We have designed each guest room so that it has its own unique personality, with some rooms featuring large whirlpool tubs, fireplaces and balconies for romantic evenings or weekend getaways. Our bridal suite with fireplace and private patio is the perfect Santa Barbara honeymoon retreat, and our executive/family hotel rooms are all clean and well-appointed. Our close attention to detail has earned us recognition as a top-rated local bed and breakfast hotel from Santa Barbara travelers on the world’s largest travel site, TripAdvisor. You’ll rave too when you book one of our available rooms like the luxurious Queen plus Balcony, which offers the largest balcony at The Eagle Inn. Sit outside around a table under a shade umbrella, or luxuriate on a sun bed soaking up the famous Santa Barbara sun. The room features deluxe hardwood floors, a cozy indoor sitting area, a queen-size poster bed with pillow-top mattress and a gas fireplace, making it unique in every way. Your room amenities include cooling air conditioning, flat-screen TV with free cable and movie channels and DVD player, large windows, and an in-room refrigerator. Don’t forget to take advantage of our complimentary, freshly-made hot breakfast which is served at your table every morning. Located in the popular West Beach neighborhood of Santa Barbara, our Eagle Inn is a comfortable boutique bed and breakfast hotel by the water that makes for the perfect Santa Barbara weekend getaway. So whether you’re looking for places to stay in Santa Barbara, planning your Santa Barbara honeymoon, or just searching for the best hotel room with a porch, you will find it all at The Eagle Inn. Stop that dreaming and start relaxing in Santa Barbara style! We look forward to seeing you soon. About The Eagle Inn: The Eagle Inn is a boutique bed and breakfast in Santa Barbara, CA. Located at 232 Natoma Avenue, the West Beach hotel is popular with tourist and business travelers, newlyweds and couples who are seeking hotels on the beach in Santa Barbara, and visitors interested in Santa Barbara wine tours. Visit the website now at https://www.theeagleinn.com to download a complimentary PDF copy of “101 Free Things To Do In Santa Barbara.” “Like” the Facebook page to receive special offers and tips on things to do in Santa Barbara. Call 805-965-3586 to ask about our Santa Barbara hotel deals, and book a reservation for your stay in the best hotel room with a porch.